There were no press screenings of PAUL BLART: MALL COP 2, at least not here in the Cleveland area, so technically I was off the hook on this one. And yet when I saw that BLART 2 would be playing at the Aut-O-Rama Drive-In this past weekend, for some reason I decided to actually pay good money and go see the film. In a further display of my poor judgment, I also chose to subject my wife and 4 year old son to the experience. They still aren't speaking to me. Let me just state for the record that I actually didn't mind the first MALL COP. No, it's not a comedy classic, but I felt it had enough laughs as was reasonably good natured. This sequel shows right out of the gate that it intends to fail on both counts. The first “jokes” the movie throws at viewers are that Blart's wife (who he had married at the end of the previous film) has left him in disgust after less than a week of marriage. Then, Blart's mom walks outside and gets hit and killed by a milk truck. Now, if this were a dark comedy directed by Bob Goldthwait or someone similarly adept at such material, that might fly, but this is ostensibly a comedy intended for family audiences. “Hey kids, grandma just got killed! Isn't that hilarious?” After this terrible turn of events, Blart's daughter Maya (Raini Rodriguez) can't bear to tell him that she's been accepted into UCLA and will, therefore, be leaving him all on his own. 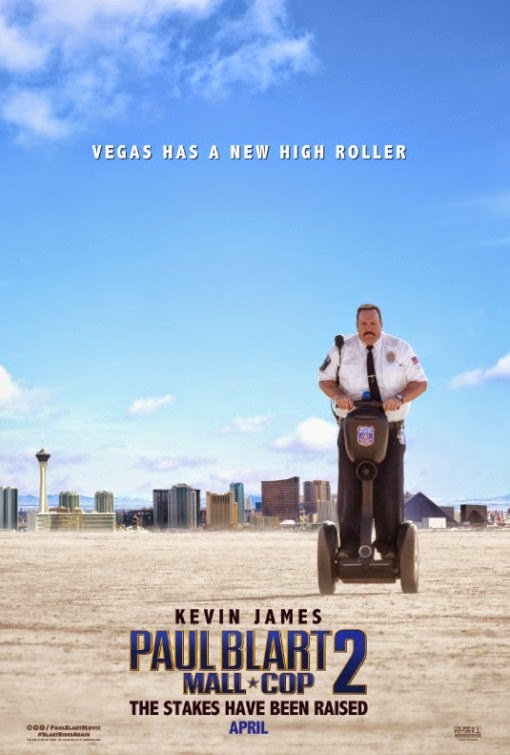 The main plot of BLART 2 is pure desperation: send the character off to Vegas, where he mistakenly believes he's supposed to deliver the keynote speech at a convention for security guards. While the convention is going on, a band of international art thieves are plotting to steal artwork from the casino hotel. Of course it all comes down to our clueless hero and his fellow rent-a-cops to save the day. The tired plot wouldn't be an issue if the movie had any laughs, but it doesn't. At least not the kind of laughs it's going for. On a few occasions, a particularly egregious gag would be so poorly executed and/or dragged out to such excruciating length that it almost enters into “so bad its good” territory, but mostly the film is just bad. The only thing I can figure is that James wanted to make sure he never had to revisit the character again and pulled a PRODUCERS, only this time I think it's safe to say PAUL BLART: MALL COP 2 won't turn out to be an inadvertent hit. 1 out of 4 stars.